"Schnitting" or sifting for artifacts. Dig, Dig, Dig. I remember reading those words over and over to my three little boys a long time ago. Dig, Dig, Dig. The words echo now from the pages of that battered and beloved Margaret Wise Brown picture book. Dig, Dig, Dig. That is what we teachers were doing on the final day of our wonderful week as a genuine professional learning community based at Drayton Hall. Taking part in an archaeological dig was the perfect ending to a perfect week. We learned how the history of the Drayton Hall site is truly the history of South Carolina—especially if you are willing to dig deeper both literally and figuratively. Digging is fascinating whether you are a little boy or a grey haired school teacher like me. You are searching for treasure. I understand now why Sarah Stroud loves her work. It is addicting that shnitting because you never know what sherd or shard you may uncover in your assigned unit. As you wash and brush an artifact, your brain cannot help but shift into critical thinking gear. Who would have worn this button on his jacket? Was this a piece of glass from a bottle of Madeira? Is this an example of stoneware or earthenware? Who smoked this pipe? Is this a part of a bowl or cup? Dig, Dig, Dig. In the morning we worked under a grey umbrella of clouds with a breeze from the Ashley River. After lunch the sun came out, and we were thankful to be digging beneath the arms of the honey locust, a sapling that had replaced the much older tree destroyed in Hurricane Hugo. Wistfulness washed over me as I worked beneath this tree which was as old as my own Hugo baby, my lovely daughter, Corinne. Like the tree, she has grown to be strong and tall in South Carolina soil, educated in public schools from elementary through college. Corinne left home in May to join the Teach for America Corps in Atlanta. I believe that her sense of place, her strong self, comes partly from her having such passionate teachers of history. As an English Language Arts teacher, I have been blessed this week to work in a professional learning community of history teachers—including music and art history teachers. The history of South Carolina is a story that must be told to all school children so that they can grow to be strong and tall like the honey locust. We need young people to be ready to solve problems, to make a positive difference, and to preserve the natural resources and history of our state. Archeology is a perfect way to expose children to history—hands on learning, critical thinking, team building, and an opportunity to appreciate their state in a concrete way. Dig, Dig, Dig. The night after the dig, I was sore and tired but full of stories when I had dinner with my parents. I talked on and on about what artifacts we uncovered in the dig and about wonderful Sarah Stroud, a fellow Randolph-Macon Woman’s College graduate. As I continued to share stories with Mama and Daddy about my week, I had to stop myself. I realized that I was talking about Drayton Hall as if it were my house, something to be treasured and protected. 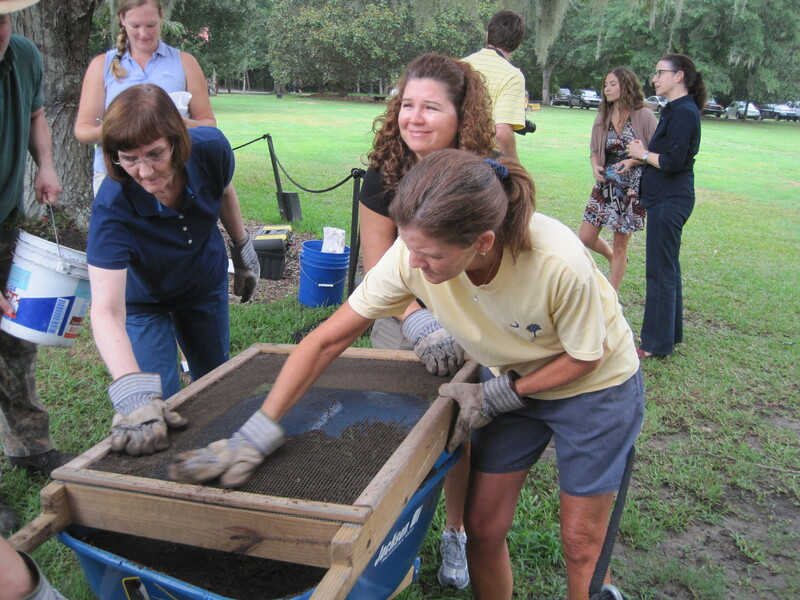 I told my parents, “I believe this week that I have fallen in love with Drayton Hall.” I think all the teachers did–especially after we had a chance to dig in the yard.